This is my front foot. It is the best one. But wait! This is my back foot. It is my other best foot. Which one do you think is the best one? P.S. Today Pimp is going for his follow-up visit to the V-E-T for his follow-up visit to retest his thyroid levels. All paws crossed that he scored good on his test! Maxx and Mikki say: Two paws up for the front paw...cause you can see Pimps sweet little heart shaped nose! 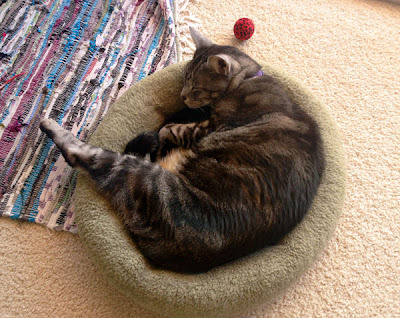 While it IS true that seeing Pimp's sweet little face is a benefit of the FRONT paw forward, the back paw forward is a picture of PURE RELAXATION, so I'm voting for that one. Isn't that just what we all need - a little R&R? Good luck today Pimp!!!!!!! I think both of them are your best feet. Pimp - they are both gorgeous. I love how they're spotted - mine just black-and-white. Good luck on your vet visit today. We call the first one "kickstand" pose. Can we just say that all of Pimps feet are the bestest? I would most certainly kiss them all if we met! :) Purrs and hugs to you and mom today, Pimp. I like the first pic, front foot, because he's looking lovingly at mama. Best wishes for perfect results at the doc! Aww, we like both pictures! Pimp looking up at you is precious and him chillaxin in the second picture is sweet. Best of luck at his appointment! What a wingspan! Pimp is a cutie and wish him (and you) the best. All of Pimp's foots are adorable! One foot, two, threeor four - all of them are adorable. Good luck Pimp, we know what you're going through. Dorian, keep us informed when you get the results! Pimp sure has a loooooong arm! He's so adorable. 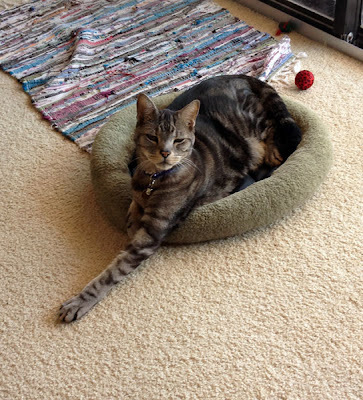 My kitty Baby Girl Emma (see pic) also likes to put her "best paw" forward. he is sooo long limbed! He is! He is a very long cat. Nice legs and arms Pimp! Fingers and toes crossed Pimps thyroid levels are good.He's one handsome looking cat!!!!!! !